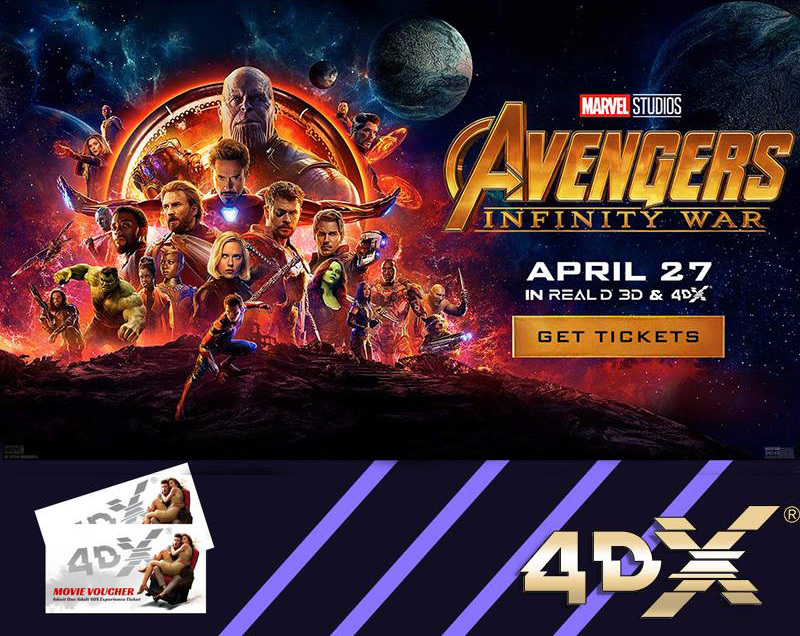 Los Angeles (May 31, 2018) – CJ 4DPLEX (www.cj4dx.com), the world’s leading 4D cinema company, today revealed that Marvel Studios’ “Avengers: Infinity War” has reached 2 million in attendance across 59 countries. This breaks the record for highest-attendance 4DX film to date. “Avengers: Infinity War” follows a string of successful Marvel Studios films released in the innovative format. These recent blockbusters include “Black Panther,” “Avengers: Age of Ultron” and “Captain America: Civil War,” which all topped 1 million attendees at the global box office and rank among the top 10 films in 4DX of all time. “With their spectacular action sequences, these films are perfectly suited to be converted into 4DX. We are excited each time we team with Marvel Studios and look forward to even more moviegoers around the world being able to experience ‘Avengers: Infinity War’ in the fastest-growing premium movie format – whether fans are seeing the film for the first time or going back to the theatre for repeat viewings,” added Byung-Hwan Choi, CEO of CJ 4DPLEX. In April, 4DX announced the opening of its 500th theatre in Paris, France. The format has continued to explode since opening its 100th auditorium in 2014 – with the opening of its 200th location in 2015, 300th in 2016, and 400th in 2017. There are now more than 62,000 4DX seats in 524 auditoriums spanning 59 countries, which can accommodate more than 110 million domestic and international audiences annually. Tags: 4DX, CJ 4DPlex, Byung-Hwan Choi, "AVENGERS: INFINITY WAR"